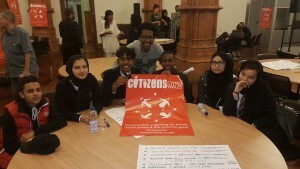 Over the last eight months, leaders from the Butetown, Riverside and Grangetown areas of Cardiff have been undertaking an accredited Neighbourhood Leadership Module with Cardiff University alongside Citizens Cymru Wales a chapter of Citizens UK that organises communities to act together for power, social justice and the common good. Citizens Cymru Wales develop the leadership capacity of their members so they can hold politicians and other decision-makers to account on the issues that matter to them. A number of the module sessions were delivered at the Grange Pavilion and up to 5 of the 20 participants were recruited from the Grangetown Community, including Araf Haq of the Grange Pavilion Project. They will now meet regularly to help bring about change in their communities by building teams around the issues that have been raised. An event sponsored by David Melding AM at the Pierhead Building in Cardiff Bay was organised by the course participants where representatives of faith groups, businesses and organisations in and around Cardiff Bay were invited to join leaders from the Butetown, Riverside and Grangetown. The ‘Bay Citizens Vision’ attracted over 80 people from the various communities to come together to organise for power, social justice and the common good. The people of Grangetown that completed the Neighbourhood Leadership course will now rally their community into action and find out what the people in their neighbourhood really want.